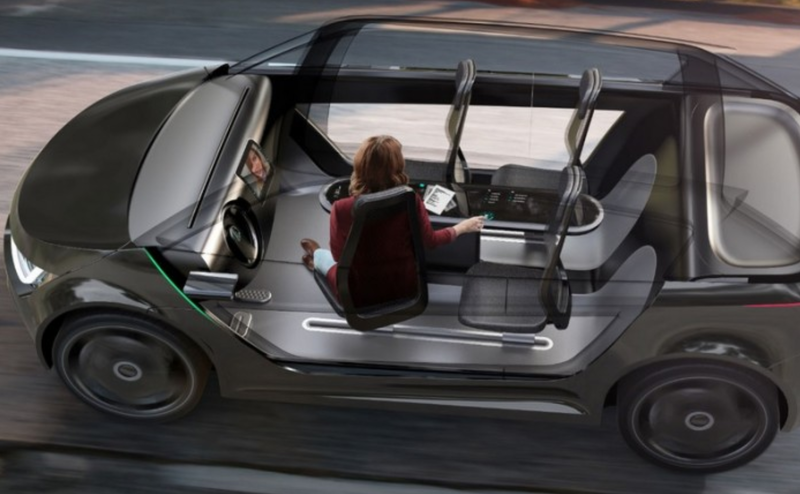 Autonomous vehicles, aka self-driving cars, are coming. And the world is going to change because of them. A lot has been written about the “first order” effects of autonomous vehicles (AVs): How they will reduce traffic fatalities, make rides more comfortable, or put truck drivers out of work. But the bigger story here is the “second order” effects — how improvements in mobility will cause us to reexamine fundamental assumptions of how we live. Let’s start with real estate. Cars (the Henry Ford kind) completely reshaped the built environment of the United States — giving us the suburbs, shopping malls and pulling people out of cities. What will self-driving cars do to our cities and suburbs? Surely something equally as dramatic. 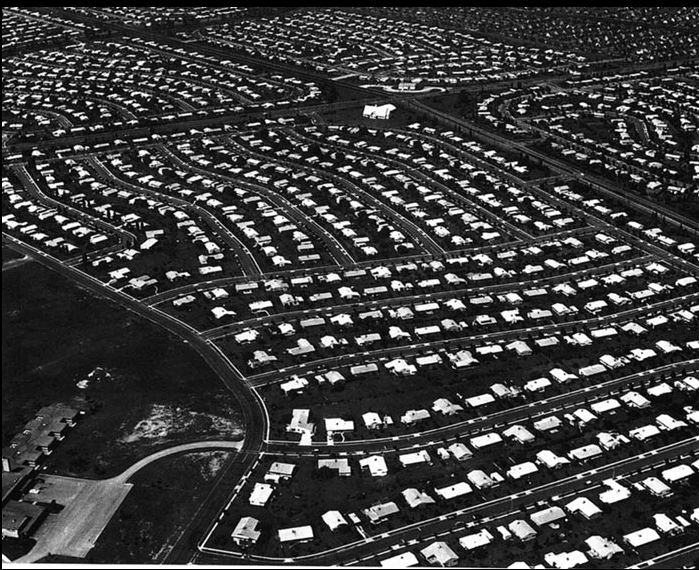 Levittown, PA circa 1959. Made possible by the car. What towns will self-driving cars make possible? 99mph was founded to take on difficult and uncertain questions like these. Our approach is rooted in hard data rather than armchair punditry. To examine the impact of AVs on real estate, we have built a proprietary model that draws in over 1 million data inputs and can yield predictions on how property will be impacted by changes in mobility at fine granularity. In this post, we will share some of our high-level findings. Want to learn more about the methodology? Email hi@99-mph.com with “1 Trillion methodology” in the subject line and we’ll share more detail. 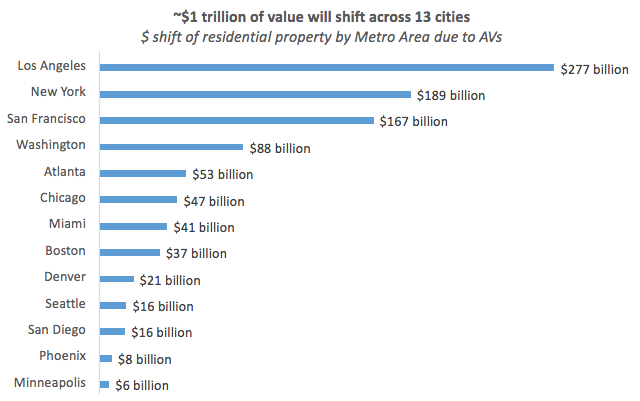 We conservatively estimate that ~$1 trillion of residential property value is going to shift across 13 major US cities due to autonomous vehicles. This value will shift from properties with a convenience premium reflected in their current price (e.g. near public transit, short commute) to properties that currently have an inconvenience penalty baked into their price(e.g. long commute, far from city center). $1 trillion may seem excessive but keep in mind that the property market is enormous — Zillow estimates that residential property in the US is worth a cartoonishly large $29.6 trillion. 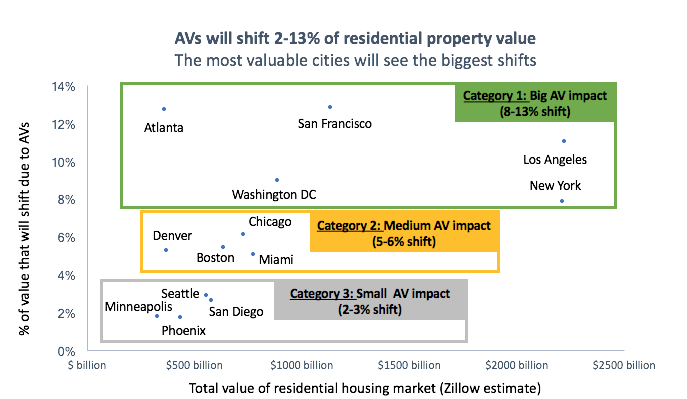 For these 13 cities, the AV-driven shift represents 2% to 13% of total residential property value. The below chart shows which cities will be most heavily impacted on a percentage basis. Let’s try to put $1 trillion into perspective: This is more than the market caps of ExxonMobil, Walmart, and JPMorgan combined. Many fortunes will be made (and maybe some lost) in this shift. Autonomous vehicles make commutes more pleasant, so people will be willing to live further out: A 40 minute commute in traffic is a different animal if you are watching TV, napping or answering email instead of focused with hands on the wheel. I used to work at Facebook and did the daily 1–1.5 hour commute from San Francisco to their HQ in Menlo Park on one of their wifi-enabled “tech shuttles.” Everyone hated the commute — who wants to spend 1.5 hours in traffic? — but the difference between a) being driven vs. b) driving myself was the difference between a) moving to a less-desirable suburban location closer to work and b) staying in my beloved San Francisco. Slight changes in commute quality will alter the calculus for millions of individual decisions on where to live. 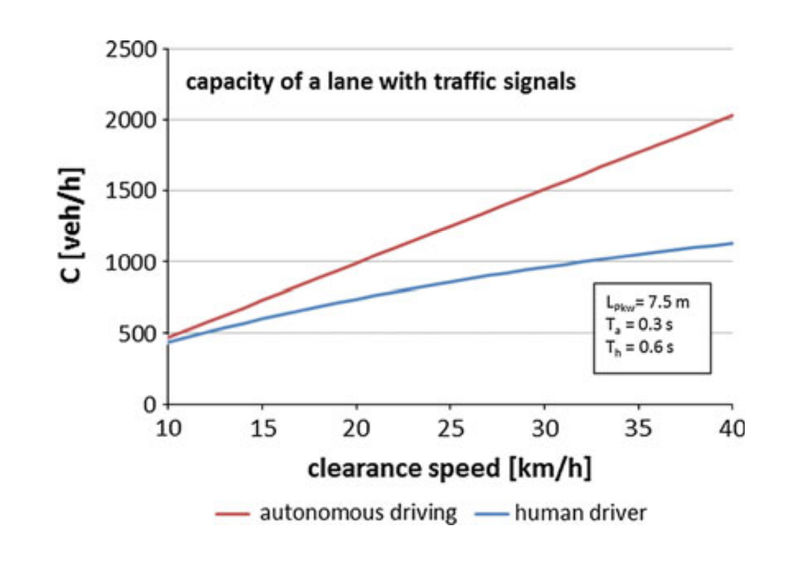 2) Autonomous vehicles may even shorten commutes: This one is hotly debated, but some believe AVs will reduce travel time by packing roadways with more cars per lane or increasing average speed through vehicle-to-vehicle communication. Others counter that the “induced demand” of more vehicle-miles traveled (“VMT” for the traffic wonks), created by better cheaper and more pleasant rides, will counteract these gains. How this will play out remains uncertain, but a reduction in actual travels times would allow for more sprawl. 3) Autonomous vehicles will eat away at public transit: This will be true for even the most convenient transit corridors. Public transit, which already struggles fiscally in most major cities and is starting to lose share to Uber, simply won’t be able to compete with the combination of convenience, comfort and price offered by efficient on-demand autonomous vehicle fleets [Btw — We don’t have to like this conclusion for it to be true… it makes us at 99mph a little sad]. Expect a correction for anywhere that “public transit proximity” is baked favorably into property values. In short, AVs compress (by either transit time or transit comfort) distances. They squish our mental maps and change the spatial relationships that govern property value. Hundreds of millions of Americans will reconsider where they live in relation to where they need to go. And businesses and employers will do the same in response. These shifts, of course, have a significant impact on property values. The next section explores where and how much. Much ink has been spilled on this topic, but not recently (most studies took place from 1960–2000) and not comprehensively (most look at a single city). With modern “big” data sources and analysis techniques, we took on a more comprehensive version. For this analysis, 99mph combines a proprietary database of 190k+ recent (<6 month) property sales within 80 miles of 13 major metros of the US. 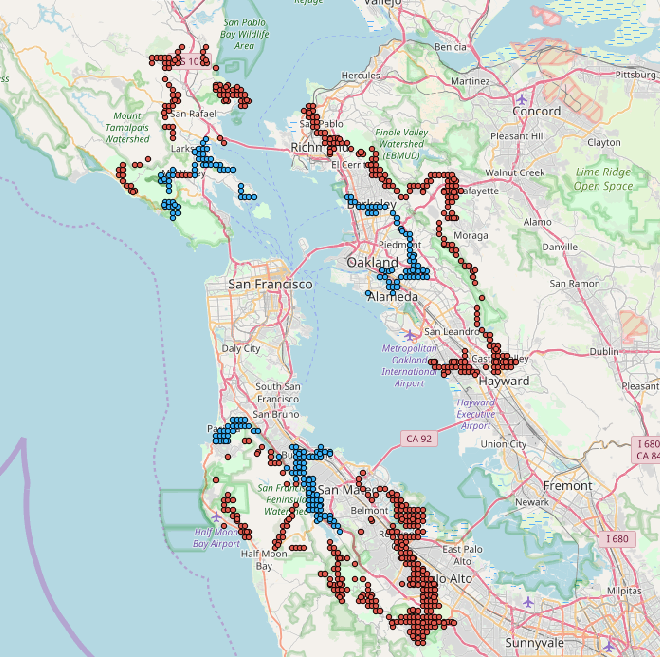 We mash it with public census data and that state-of-the-art traffic database known as Google Maps (who thankfully provide an API to all their wonderful data). How does driving time to city centers relate to property values today? This might help us answer how it is going to shift in the future. In Washington DC, a large amount of variance (61%) in property values can be explained by how close the property is to the city center. We’ll see shortly that this is not true of every city. But it is true in DC. From this chart alone (not controlling for other factors), here’s what you might conclude: If someone’s painful 40 minute commute to downtown Washington DC magically begins to feel like a 35 minute commute, a $376k home, the average for DC in our dataset, should be worth $19,000 more. (e^(5 mins * 0.0098) * $376k = $395k). This is real money for an individual homeowner and a huge economic shift aggregated across a metro area. What does this mean for the DC metro area as a whole? The actual model we use at 99mph considers more factors than just the single variable above. In our full model we estimate that $88bn will shift in DC. Some of the biggest beneficiary zipcodes are below. But wait.. (you say) … people don’t always commute to the center of the city. You are correct. A city is called a “monocentric” city when a large portion of people commute to a central downtown. DC behaves like a monocentric city. Let’s take another example: Phoenix. Phoenix is a “polycentic” city. People drive every which way to get to work. 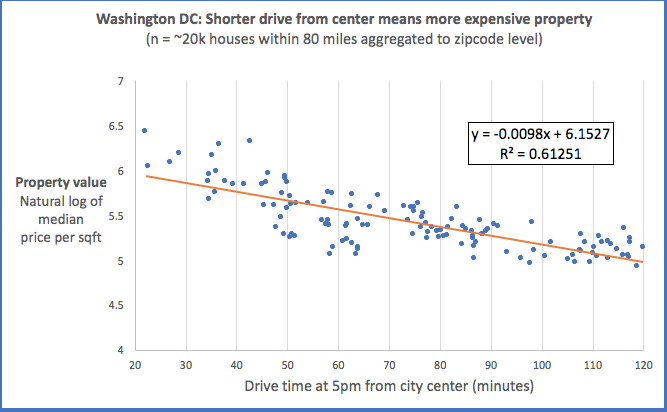 As a result: The relationship between city center drive time and property value looks different than DC. 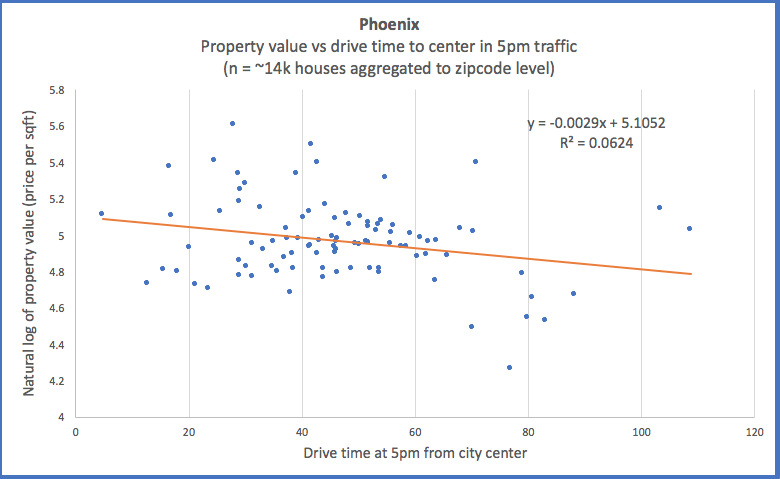 Drive time to city center is NOT a good explanatory variable for property values in Phoenix (R² = 6%). No fit. Don’t assume monocentricity when it’s not there. Will autonomous vehicles impact property values in polycentric cities like Phoenix? Yes, they will. People’s commutes to their work will still be impacted, even if they don’t commute to a single city center. Polycentricity is harder to model, but the impacts will be just as real. 99mph’s model accounts for Phoenix’s polycentricity by considering multiple places of work outside of the city center. As a result our model is able to explain 70% of the variance in housing prices in Phoenix. Historically, proximity to public transit has had a favorable impact on real estate prices. The table below demonstrates the impact of a handful of transit projects. 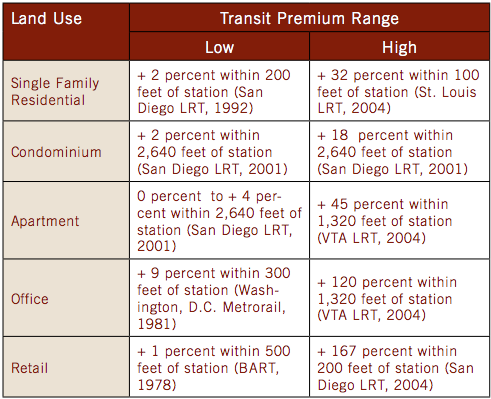 Another study by APTA pegs the value premium of being within 1/2 mile of transit at 42%. Real estate near transit is likely to be a loser in the coming shift to AVs. The “premium” from transit proximity will shrink as AVs eat away at usage, particularly for rail lines (some think buses will fare better in an AV world because they can adapt to the new tech). This premium will likely be disbursed broadly amongst non-transit neighborhoods. The bottom line: We are going to see a broad shift of value from properties where “convenience” (e.g. good commute, short distance from center) is priced positively into their value to properties where “inconvenience” (e.g. bad commute) is priced in negatively. Those differences will flatten and equalizes over time. 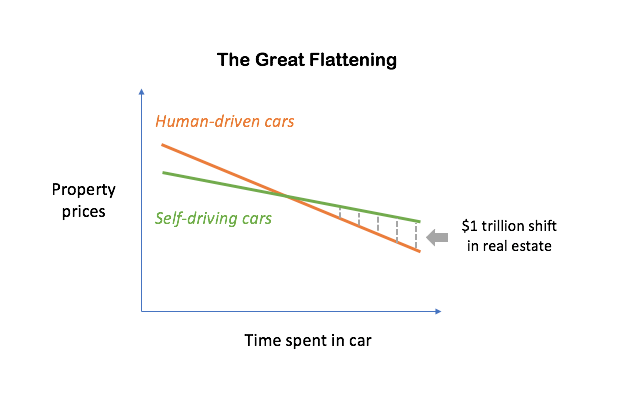 This “Great Flattening” represents a tremendous shift in value. Simple concept, harder to model. But wait, isn’t this in the distant future? Opinions vary on the big question: How soon? We may not see mass adoption of fully autonomous L5 vehicles for a couple decades. 1) Future expectations, not current reality, drive asset prices: Asset values are based on *expectations* of future events. We should see shifts in asset values before the events actually take place. An example of this is when a neighborhood begins to change on the mere announcement of a transit project, rather than its completion. This means property values may shift 5–10 years before AVs really hit the road. aka … now. 2) Partial autonomy is here already: Don’t think we’ll see 100% L5 autonomy anytime soon? You are not alone. But we are already seeing lesser forms of autonomy today. A Tesla Autopilot system — sometimes called L2 autonomy — already makes commuting more comfortable. And this technology will diffuse into mass market cars quickly. You don’t need full autonomy to put these shifts in motion. Anything that makes a long drive a bit more pleasant will start to shift how people view distance — and therefore property values. For real estate investors: A fortune equal to the combined market cap of ExxonMobil, Walmart, and JPMorgan is up for grabs. For city planners: Sprawl will be subsidized, forcing planners to consider growth restrictions and what value we put on density. Champions of urbanization should be alarmed.